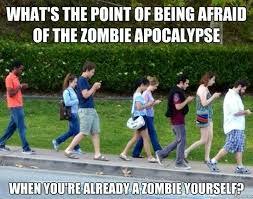 n today’s world, everyone is walking with their heads down. Walking and reading with their heads down staring intently into their smartphones. It’s an obsession and it’s everywhere. 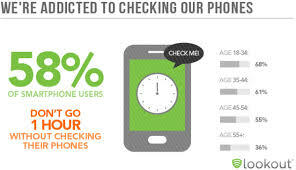 Smartphones have become the new crack for humans these days. It’s pervasive and everywhere. 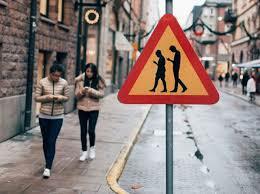 People get hit by cars, not only because pedestrians are staring into smartphones, but also drivers. It’s an epidemic. I heard a story the other day about the NBA. A coach lamented the fact the teams today don’t play as teams 20 years ago. They are separated in a sense. Players are completely isolated in that they never talk or interact because they are so dedicated to their phones and music. 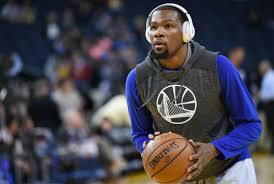 For example, they always have Beats headphones on and no one talks to each other, not during travel, practice, locker rooms, or walking to and from games. This extends into all aspects of modern social and work life. 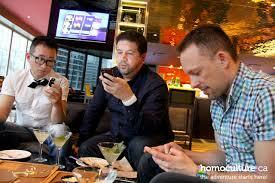 People are losing the ability to interact socially unless it’s on social media. And forget about dining out or eating at a table at home! IT CAN WAIT. Leave it in another room or in your car. Think of it as a little prize to go find for later! What are we going to do, start having board meetings via Snapchat and Facebook Live? Social media companies would just LOVE that! I don’t know man, for me I love leaving my phone alone for periods of time. It’s that delayed future gratification that I look forward to if I need to think about it. Let’s be honest, more often than not, it’s a tremendous delayed disappointment. But, that’d been the case if I’d had it by my side at the Cracker Barrel too. If a person is already fully addicted to it, stopping the need is like trying to detox from crystal meth. Can’t we re-tool ourselves with a little bit of self-control to train ourselves to look forward to a tiny little bit of self planned easter egg of looking at our phone AFTER we do something else? I think it’s possible! In the end, maybe, JUST maybe it’ll help us realize how largely pointless all of this Smartphone monitoring truly is.